This is the logo for Remembrance Ledegem. 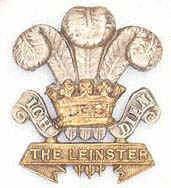 It depicts the crest of Ledegem and the maple leaf insignia from the Regimental colours of the Leinster Regiment. The maple leaf (representing the 2/Leinsters) is shown approaching Ledegem. For those members who participated in this event and who are anxious to view the photographs, may we ask for your patience as we work on producing the photo record and report of this spectacular event. The 90th Anniversary commemoration of the liberation of Ledegem. The Association paraded in the Community of Ledegem in Flanders (Belgium) to participate in the commemoration of the 90th anniversary of the liberation of the Ledegem on the 12th October 2008. During the ceremony the Leinster Regiment Association was presented with the Freedom of City of Ledegem. This event also included the unveiling of a new monument to the Regiments of the 29th Division of ll Corps who fought to free Ledegem in 1918. On the first day of the Battle of Courtrai that started at 5.34 am on the 14 October 1918, the 2nd battalion of the Leinster Regiment, as part of 29 Division, led the advance on Ledegem, supported by 4 Battalion of the Worcestershire Regiment. In the fierce fighting that occurred that day two Leinster soldiers, Sgt John O'Neil and Pte Martin Moffat went on to win the Victoria Cross.